India is the world’s largest supplier of handmade goods owing to our 9 million+ strong weaver and artisan community spread across 600 clusters, in the form of cooperatives and community-based enterprises. More than a hundred years old, the successful cooperative movement, nationally and globally has played a significant role in uplifting the socio-economic status of the rural populace. Led by a large global movement of socially-conscious buyers of handmade crafts and ethical goods, Indian crafts are supplied by over 240 million artisans and weavers and accounts for $7 billion of the global market. Despite these impressive numbers, co-operatives in India (currently more than 600,000) which are largely rural entities are plagued by many challenges which hinder the growth of its’ members. Since, producer communities are vastly disaggregated with small/low capacities and lack of professional management, the key challenges include – aggregation of producers, marketing, efficient and transparent sourcing of products to name a few. These lead to over-exploitation by middlemen and traders, further resulting in unfair payment terms and low prices, thereby not allowing people to escape the vicious cycle of poverty. While the above talks about the issues of the weavers and artisans, another largely ignored area is the lack of easy and efficient commerce collaboration between cooperatives and consumer markets, which cause inefficient pricing mechanisms, resulting in less commerce. Thus, there is a strong opportunity to connect co-operatives with consumer markets, enabling effective market linkages. Started in August 2014, GoCoop is India’s first online marketplace platform that connects handloom and handicraft producers with national and international buyers, enabling wider access to markets, allowing co-operatives to gain higher profits. GoCoop offers multiple services for different types of sellers that are part of the cooperatives. It’s e-commerce service is mainly for B2C sales and it also has an ever-increasing directory and microsite services that facilitate trade or B2B enquiries. Additionally, GoCoop also enables cooperatives to collaborate by creating commerce networks to connect with suppliers, complementary co-ops and wholesale buyers nationwide. This is based on a unique method (patent pending) for market linkage between potential buyers and sellers. In order to ensure high levels of curation, quality control and design, GoCoop regularly conducts theme-based workshops that allow weavers and artisans to stay up to date with the current market trends and pricing. GoCoop.com is India's first online Global marketplace that enables Handloom and Handicraft Co-operatives and artisans in connecting directly with Buyers. GoCoop was identified as TOP 50 INNOVATORS as part of the Dept. of Science and Technology, Lockheed Martin India Innovation Program. In a short span of time, GoCoop has already onboarded 40 clusters or 4,300 registered cooperatives which have approximately 60,000 producers across Karnataka, Tamil Nadu, Andhra Pradesh, Telangana, Kerala, Jharkhand, Maharashtra and Orissa. GoCoop has already delivered more than 5,000 orders to over 8,000 registered buyers. with the company caters to both B2B and B2C markets and sells to large groups such as Aditya Birla and Reliance to name a few. Recently, GoCoop raised Series A from existing investors (Indian Angel Network and Unitus Seed Fund) and new investors (Saha Fund and Kris Gopalakrishnan). The company is aiming to expand to 100 clusters in the next 24 months and reach 100,000 customers along with 1,000 B2B buyers in the next 36 months. Siva, an entrepreneur, is passionate about technology innovations that impact low-income populations. 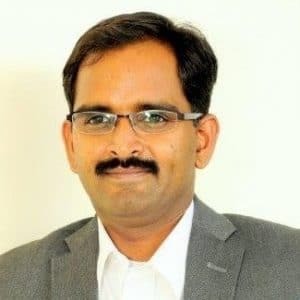 He has over 12 years of experience in technology and consulting and prior to founding GoCoop, he was Director of Accenture’s India Innovation Centre.